As a follow up to a previous post this summer, Retail Holdings ("ReHo") stated they were planning a sale of a portion of their equity interest in Singer Asia via a listing of a newly formed holding company Sewko Holdings (which in turn owns 100% of Singer Asia) in Singapore. Unfortunately, the IPO date has been pushed back to sometime in 2014. I'm not entirely sure what to make of this announcement as the markets, at least in the US, are at all time highs and it appears like a great time to come public. I can only assume that they were unable to get a valuation close to the underlying value of the operating subsidiaries as that's been a target value in past annual reports. ReHo has also done this before when they announced the sale of the Bangladesh subsidiary before terminating that agreement due to market conditions. Is over promising and under delivering starting to become a pattern? ReHo still seems very cheap at current levels, even if an IPO is a year off. But why was the IPO delayed? There was a Seeking Alpha article published a little over a month ago that did a good job of laying out the liquidation thesis, but a few commenters pointed out that an IPO might not close the valuation gap because Sewko would still be a holding company of publicly traded subsidiaries and still deserved a conglomerate discount. I had the link to the preliminary prospectus, but its now dead, luckily I printed out the corporate structure and ownership as I was struggling with the question of whether Sewko deserves a discount. The publicly traded subsidiaries are highlighted in yellow. Hopefully its readable. 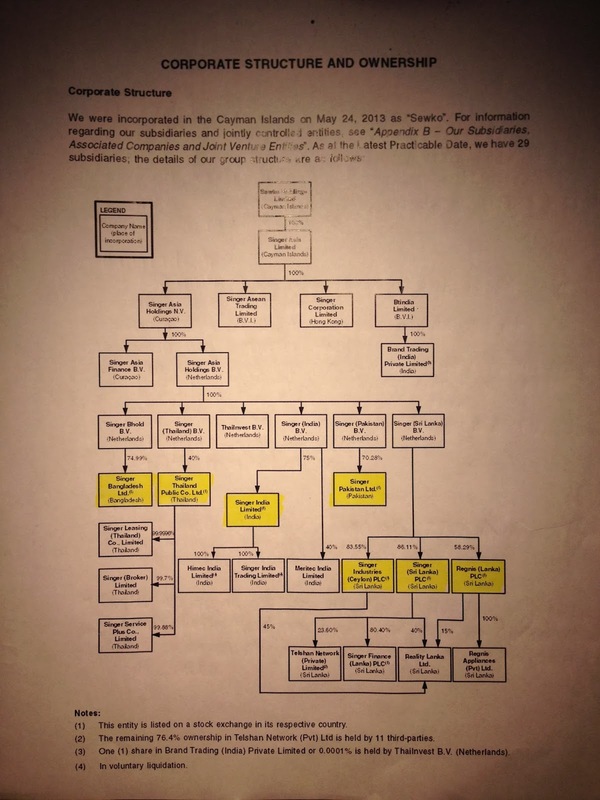 All of the operating subsidiaries other than Singer Thailand are controlled companies and majority owned. Throughout the now dead draft prospectus, Sewko gave the impression that they control all of these subsidiaries and that they're essentially operated as one Singer. I'd also argue that the market is relatively efficient and would price the operating subsidiaries at a discount in their home markets given the ownership structure and the minority shareholder position. But it's still an issue that potentially prevents ReHo from realizing the full value out of a Sewko IPO. I've also been corresponding with another ReHo shareholder that has concerns about the company's lack of operating cash flow for the past several years, which is certainly a bit concerning on the surface, but given the complexities of the consolidated accounting rules and different holding company structures I hope there's a good explanation? Given the failed IPO, I think its wise to be a bit skeptical of the full NAV as a short term price target. I'm open to any thoughts or comments from other holders on why the IPO might have been pulled, but these were a few thoughts I had today after hearing the bad news. I'm still holding, but my conviction in the liquidation thesis has been taken down a notch, it might be time to take a closer look under the hood. On Monday, Ultra Petroleum announced the acquisition of an oil asset play in the Uinta Basin located in northeast Utah for $650 million. 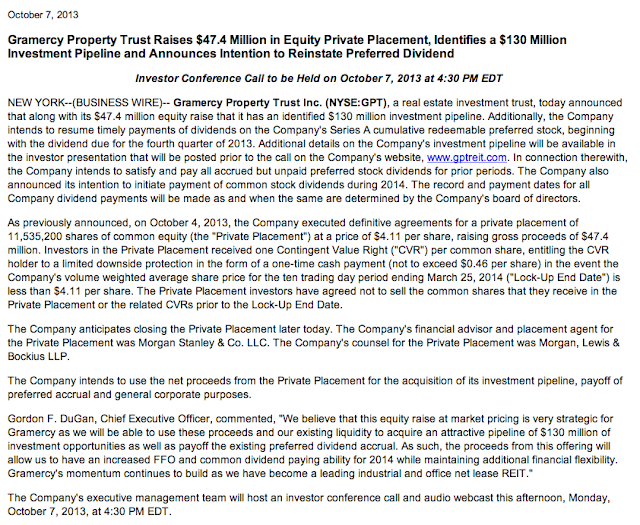 The initial details and return figures of the acquisition sound great, almost too good to be true. Ultra hasn't disclosed the buyer, but I'm sure that will come out as the details flow through SEC filings, but why would the other party sell at these levels of returns? I'm admittedly an oil and gas industry novice, but the quoted returns at 60+% IRRs are great, right? The acquisition also seems designed as a way for Ultra to ride out the low natural gas environment by focusing their efforts on this oil play that is cash flow positive in year one and has a paid back period of approximately five years. Using 2014 production estimates, Ultra will now be a 90% natural gas and 10% oil, versus about a 97% and 3% split currently, which slightly impacts my natural gas macro thesis (and might cause some slight investor churn). The oil acreage does come at a significant cost, Ultra is financing the entire $650 million through a combination of their credit facility and additional senior notes. This will increase the debt load by 35% for an already leveraged company but given the quick payback nature of the acquisition, may still be a reasonable level, just limits their flexibility in the near term. 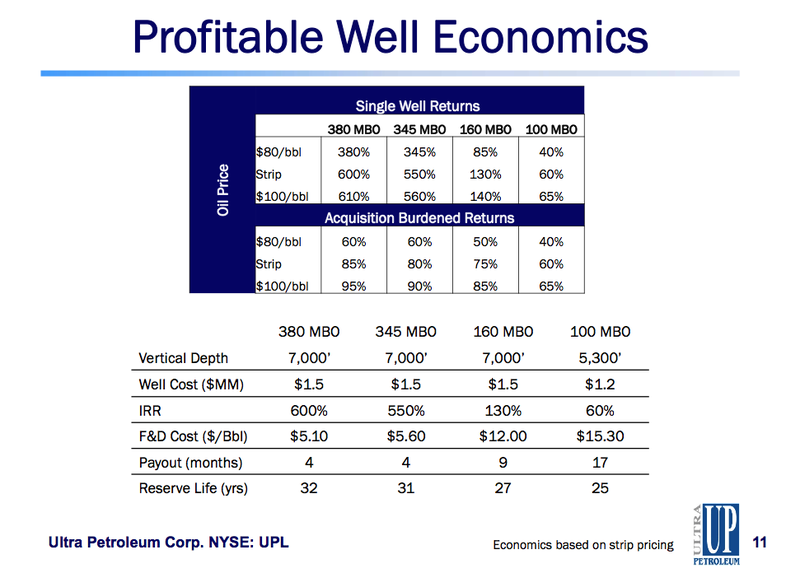 It still appears to me that Ultra Petroleum is an undervalued business, but I'm also beginning to fully understand my limitations as an investor and evaluating oil and gas exploration companies might not be in my circle of competence. The market didn't like the acquisition, the price popped after the initial news but has declined well below the pre-news level since, but I'm going to be patient here and see if management can meet their lofty return goals. Over the summer, the "Old News Corp" split up the business into two, the parent company was renamed 21st Century Fox and retained the entertainment and media assets, while the spinoff kept the News Corp name and was castoff with the less desirable publishing and newspaper assets. Media mogul Rupert Murdoch remains the Chairman and CEO of 21st Century Fox, but also became the Executive Chairman of News Corp and, along with his family, controls 39.4% of the voting right Class B shares. Even though he appears to have less influence over News Corp compared to 21st Century Fox, his reputation and heart is more on the line with the publishing and newspaper business. At the May 28th investor day in New York (where the below slides come from) he started off the conference by saying "I have been given an extraordinary opportunity most people never get in their lifetime: the chance to do it all over again." Rupert Murdoch inherited a paper located in Adelaide, Australia and turned into it the combined 21st Century Fox and News Corp in 60 years, an impressive record. So there are lots of attractive investment themes at play here for the new News Corp: (1) a smaller unwanted spinoff that was designed to showcase the larger parent's more attractive growth businesses, (2) an owner/operator that is financially committed to the business, (3) an out of favor business with a clean balance sheet and attractive non-core assets that provide a margin of safety. As I'll layout below, the new News Corp features several non-newspaper assets and a cash heavy balance sheet that when accounted for on a sum of the parts basis roughly equal the entire market capitalization of the company, so you get the newspaper businesses for "free" which generate over 70% of the company's revenues. While the "for free" argument has significant flaws, when that business is the vast majority of News Corp it makes it a much more compelling thesis. Australia is a rabid sports nation and News Corp owns its largest sports cable channel family in Fox Sports Australia, which is comparable to ESPN's dominance in the U.S. but on a smaller scale as Australia only has 23 million people. The cable channel business is still an attractive one as content providers get the dual income stream of subscription fees and advertising revenue. Additionally, News Corp along with Telstra Corp, Australia's largest phone company, each own 50% of Foxtel which was formed in 1995 and is an Australian pay television company operating cable, direct broadcast satellite television and IPTV services. Foxtel is a dominate player in this space with over 2 million subscribers or roughly 30% of Australia's market. In September 2012, News Corp purchased Consolidated Media Holdings in Australia for roughly $2B, doubling their stake in both Fox Sports (from 50% to 100%) and Foxtel (from 25% to 50%). Extrapolating this valuation to News Corp's entire stake and you get roughly a $4B valuation for this segment. It's interesting that this segment was included in the News Corp spinoff and didn't remain with 21st Century Fox with the rest of the TV and entertainment assets. The company cites synergies with the publishing and media assets, but I would guess its more to provide an attractive asset or two (along with REA Group below) to carry the newspaper and publishing assets until there is a clearer path to monetizing the shift to digital. 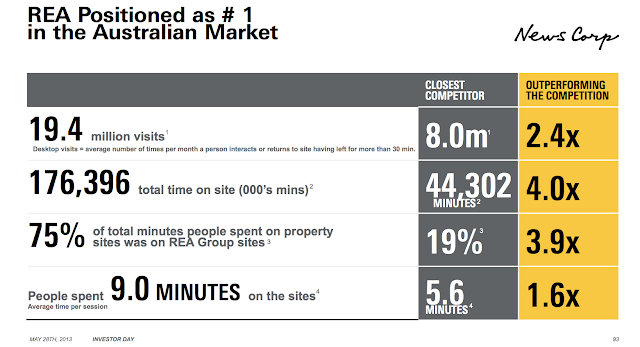 News Corp owns a 61.6% stake in the largest residential property website in Australia, REA Group (REA.AX), another non-core asset. REA Group owns and operates Australia's largest residential property website, realestate.com.au, and Australia's largest commercial property site, realcommerical.com.au, which together have approximately 20.6 million desktop visits each month. Many believe that Australia remains in the midst of a large real estate bubble, the topic has its own detailed Wikipedia entry even though it hasn't popped yet. A down turn in Australian real estate values would presumably have a negative impact on REA Group's value as its been a pretty high flyer momentum stock, but its growth is nonetheless impressive. REA Group is publicly traded on the ASX and has a market capitalization of A$5.38B implying News Corp's stake is worth $3.2B. News Corp consolidates REA Group on its balance sheet, but doesn't have an intention of acquiring the remaining minority shareholders and is content to collect the dividend. I'm a little skeptical on the synergies between REA Group and News Corp's other Australian assets and would welcome a sale of their stake given the overheated real estate market. News Corp operates HarperCollins the second largest English language publisher, which publishes over 200 best sellers every year. In their stable are many of the popular fiction, children's and religious authors. The book publishing industry is changing rapidly due to e-readers and tablets as more consumers download book content digitally. Unlike the music industry where digital downloads essentially eliminated the album format and consumers chose to buy individual songs instead, consumers can't really do that with books, you don't buy only the 3rd chapter of a bestseller, you still buy the entire book. 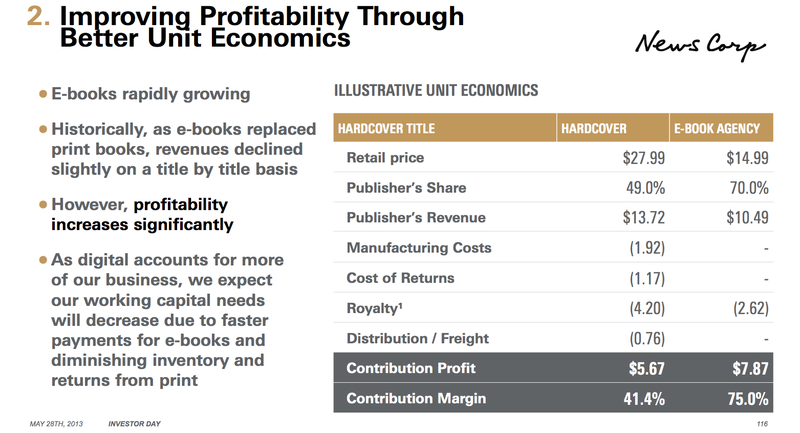 This means the book publishing industry actually benefits from digital revenues as their margins increase as the production costs, return costs, and working capital needs (inventory) are much lower. Below is a slide from News Corp's initial investor presentation showing the margin differential between hardcover books and digital copies, the difference between the two was surprising to me. News Corp's book publishing business generated $142MM of EBITDA in fiscal 2013, putting a reasonable 7x multiplier implies a value of $1.0B for the unit. 21st Century Fox was generous to the new News Corp and left it with a strong balance sheet featuring approximately $2.5B in cash and no debt. News does have an underfunded pension liability, but with interest rates likely to rise over the near to medium term, the liability should be less of an issue as interest/discount rates rise reducing the accounting value of the pension benefits. So the main thesis, that purchasing shares today essentially gives you the newspaper assets for free, is laid out below. 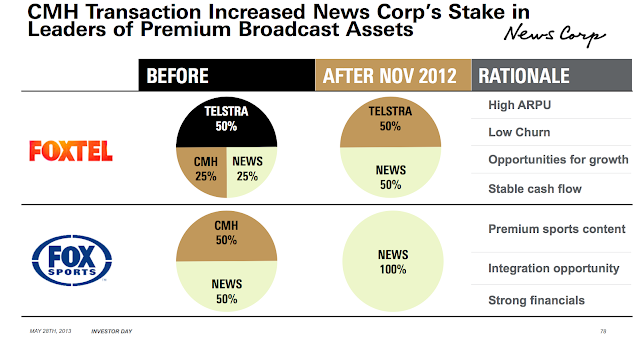 The values below might be on the high side based on the control premium that News Corp had to pay for CMH and the potential bubble of real estate prices in Australia inflating the market price of REA Group, but I think it still clearly illustrates the remaining newspaper businesses within News Corp are being considerably undervalued. So without any consideration for the News and Information Services business and the optionality of the Amplify digital education business, the other assets of News Corp values are greater than the current market capitalization ($9.72B) of the entire company. So with that in mind, below are the assets the market is heavily discounting and could represent significant value if News Corp is able to drive revenue growth through digital platforms. 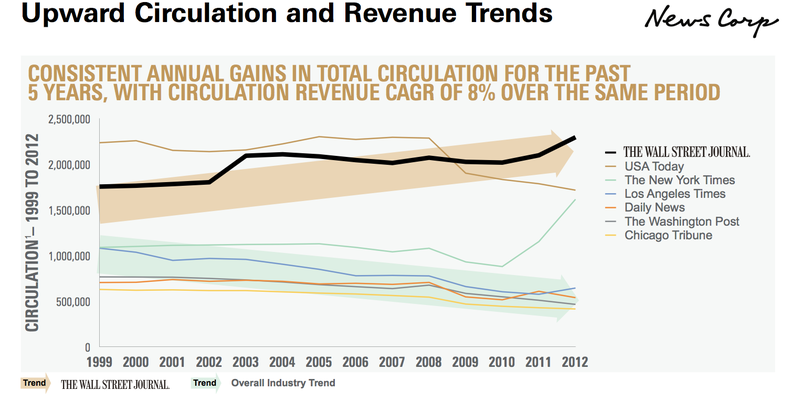 The News and Information Services division of News Corp generated over $6.7B in revenue last fiscal year (~75% of the overall company), for $795MM of EBITDA, so despite the challenges facing the industry at large as people continue to move away from print to (mostly free) digital, this segment has tremendous value. News Corp, and specifically The Wall Street Journal, as been on the forefront of the switch to digital and actually being able to charge for their content. The real value driver for this business segment will be whether News Corp is able to take that model and apply its other papers in the UK and Australia. Dow Jones & New York Post: Back in the pre-Great Recession days the old News Corp purchased Dow Jones for $5B in 2007, its probably worth substantially less now but its also worth noting that The Wall Street Journal has also grown its circulation by 8% CAGR during that time (graphic below), when most other newspapers have been struggling. The Wall Street Journal is the number one daily newspaper in the U.S. by circulation, and has been proactive from the beginning in creating a valuable pay wall online where others have had difficulty making the transition. WSJ is a strong brand with a focused demographic where many of its subscribers are not price sensitive (for instance, my work reimburses me for my subscription) giving News Corp ample room to raise prices in the future. Dow Jones also has an institutional business, the model here is to create a Bloomberg like service where customers pay for real time business news, analysis and statistical data. Additionally, News Corp owns the New York Post, the oldest daily newspaper in the country that's known for its outrageous headlines (particularly towards NY sports teams) and their Page Six celebrity section. However, the New York Post is said to be a money losing operation, but also a Murdoch favorite so its likely to stick around. News International (UK): News Corp is #1 by print sales in the UK with 35% market share, it operates the #1 tabloid in the UK in The Sun, the #1 quality Sunday newspaper in The Sunday Times, and one of the top quality dailies in The Times. The UK operations reputation was given a significant black eye after the phone hacking scandal at The News of the World in 2011. Early in 2013, News International gave a glimpse at its strategy when it acquired the rights to online and mobile highlights of English Premier League matches for three years. It will show them on the websites and mobile apps of its three remaining newspapers. The Sun recently started charging for digital subscribers 2GBP per week for its content, it will be interesting to see how well this strategy works in the next few quarters. News Corp Australia: News Corp owns a smattering of newspaper and magazines in Australia, including daily newspapers in each of the major cities (The Daily Telegraph - Sydney, Herald Sun - Melbourne, The Courier Mail - Brisbane, The Advertiser - Adelaide) and the only national newspaper in The Australian. As of June 30, 2013, its daily, Sunday, weekly and bi-weekly newspapers accounted for more than 59% of the total circulation of newspapers in Australia. The Australian newspaper assets probably have the furthest to go in the switch to digital, but at least management has a playbook to work off of and the desire to institute the pay wall model. How much these business are worth is pretty hard to say given the rapid change going on in the industry, their declining revenues, but you don't have guess someone's weight to know they're fat, I believe the market is being unfair and valuing these businesses close to zero. Another way to look at the valuation would be to strip out the non-core publishing assets (Foxtel, Fox Sports Australia and REA Group) and look at the EV/EBITDA valuation the market is putting on the core newspapers and book publishing businesses. Despite what News Corp says publicly, the Australian TV and RE assets seem rather non-core and appear to be included in the new News Corp in order to temporarily support the struggling publishing assets. As a natural contrarian, I'm attracted to these publishing assets, but also appreciate the margin of safety provided by the non-core assets. Other miscellaneous stuff that should be mentioned when talking about the new News Corp: At the time of the spinoff, the new News Corp authorized a $500B share repurchase plan to support the stock in the event that holders would elect to sell their shares in the publishing business. As of the 6/30 fiscal year end, News Corp has not repurchased any common stock. News Corp will likely pursue some acquisitions although its unclear what form they will come in as they would likely face regulatory scrutiny over any newspaper purchases in their current markets. There is some risk to having this much cash burning a hole in Murdoch & Co's pockets as evidence by the $5B price tag they paid for Dow Jones in 2007, and the even worse $580MM News Corp paid for MySpace before wrecking it and selling it for $35MM in 2011. News Corp is heavily investing in their educational start up that hopes to reshape the way K-12 is taught in America through digital content delivery. In fiscal 2013, Amplify featured a $163 million EBIT loss. This investment is a long term one, also one that operates in an industry with a lot of entrenched (union labor) interests that are averse to change. While it is strange that the education sector has been exempt from technological change, much of the free cash flow of News Corp is going to Amplify, so an investment in News Corp rests somewhat on their ability to create a profitable and useful benefit (unlike most of the for-profit sector) in this segment. Expect additional losses for the next 2-3 years, although management has indicated that starting with the 2014 school year, we should see some progress on Amplify's adoption level. In totality, I'm willing to bet on Rupert Murdoch's attempt to recreate the magic in the new News Corp and rebuild his legacy after the UK phone hacking scandal. The non-core assets that were included in the spinoff provide a nice margin of safety giving management a little time to monetize their undervalued and underutilized newspaper/digital content brands. I would put the initial fair value at least 50% higher, and potentially more if the market warms to digital content assets like the ones in News Corps portfolio. Disclosure: I own shares of NWSA (purchased today at a cost basis of $16.76). NWSA are the non-voting class A shares, NWS are the voting class B shares, otherwise they are economically the same. Exciting day for long time Gramercy shareholders, management must have received a lot of questions regarding their equity raise press release last Friday without many other details, like what the money would be used for? This morning, Gramercy reissued a press release announcing it had identified a large pipeline of acquisitions and that it will pay the accrued preferred dividend in full this quarter.﻿ They also stated their intention to begin paying a dividend to the common shareholders starting next year (likely Q1?) which will mark its final step in its transformation from a commercial mortgage REIT to a net leased equity REIT. The large investment pipeline is great news as it will be accretive to Gramercy's NAV as it takes advantage of the spread between private and public market values (although I'd assume its narrowed in recent months). It also makes sense why management was willing to give the private placement investors the downside protection granted in the CVRs as these acquisitions should increase Gramercy's market value as it gains scale. I probably won't be able to listen into the conference call live this afternoon, but I'll update this post if there's anything that strikes me as interesting. And as I've said before, I'll probably sell most, if not all, of my outsized position once the dust settles a bit and Gramercy is being valued and talked about like a normal equity REIT. Despite the government shutdown grabbing all the headlines, good management teams at both Gramercy and Howard Hughes are moving forward with their business plans. In the past two weeks, both have issued press releases announcing capital raises. With Gramercy, it's a little more puzzling as the capital raise raises quite a few questions itself, below is the press released issued Friday after the close of the market. As of the end of the second quarter (including pending asset purchases), Gramercy had $96.9 million of acquisition capacity, and during the third quarter, they announced only $20 million in asset purchases which about half appeared to be in the pipeline previously, so I'd estimate they have $85 million remaining without any undisclosed purchases. Additionally, Gramercy announced this quarter that they closed on the long awaited credit facility, which has $63.8 million in initial borrowing capacity. Since the acquisition capacity numbers already assumed paying the preferred dividend, plus the credit facility, and now an additional $47.4 million in equity raised, what does Gramercy have in mind for all this dry powder? My best guess would be a rather large acquisition similar to the Bank of America JV that would give Gramercy scale, spread the MG&A expenses over a larger base, diversify their tenants and finally pay the dividend. One other interesting feature of the equity raised was the corresponding CVRs the private placement investors received protecting their initial downside. I think this is a good signal from management that a floor is in place here, hopefully they wouldn't risk additional shareholder capital and make this capital raise even more expensive. CEO Gordon Dugan has delivered all along, it won't be long before we find out what he's been up to lately, I'm hoping for good news. I haven't mentioned Howard Hughes on the blog since I wrote a few posts about them earlier in the spring. The story is fully intact, this past week management gave a new investor presentation that's available on their website. I think it's interesting how they're fully going about monetizing their master planned community assets (a difficult asset to have in a public company) and utilizing that cash to develop and redevelop long term operating assets. It's really going to be a great case study in long term capital allocation that will probably spur additional spin-offs in the future. But anyway, Howard Hughes recently raised $750 million through the issuance of senior bonds, they had previously announced a $500 million offering, but that must have been oversubscribed. The redevelopment of their Ward Village development in Honolulu will be capital intensive, so I'm guessing a lot of this money will be directed there in addition to the Shops at Summerlin and their Woodlands commercial development properties. The potential of Howard Hughes remains great, just the Ward Village alone is a $7 billion opportunity with 30% profit margins, simply just have to sit back and wait. I apologize for the lack of posts lately, just have been standing still with my holdings (which I think is important sometimes, the best move is often no move at all) and waiting for a few situations to develop. Hopefully I'll have a few more ideas in the coming weeks to share. I also just finished up The Manual of Ideas by John Mihaljevic, it was a good read and a nice refresher on different value opportunities/themes as well as providing a lot of good tips for sourcing and screening ideas.